Intermec's flexible RFID Smart Labels and tags provide a versatile architecture that can be used in open or closed loop environments. 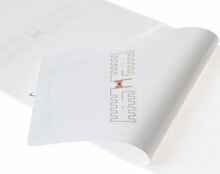 Thermal transfer or direct thermal printing and chip encoding enable on demand generation of durable RFID labels and tags that can be deployed with confidence to meet a broad range of customer requirements. The Intermec ITTG9152004 is also known as Intermec Technologies	INT-ITTG9152004	.